Senior Emily Poehlein scored the lone goal in Vassar’s 1-0 victory against ninth- ranked Montclair State. The red-hot Brewers have won five straight, moving to 7-1 with the upset win. Poehlein leads the team with eight goals this season. Courtesy of Nick Jalla. 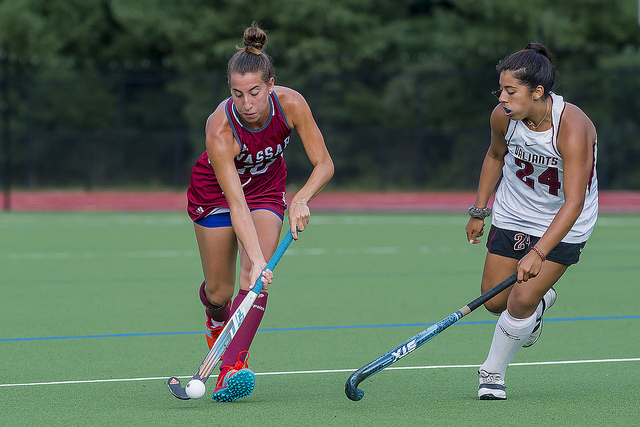 The Vassar field hockey team has enjoyed an impressive start to its 2018 campaign, strong enough to see the Brewers rise to a #16 national ranking. However, a matchup against ninth-ranked Montclair State on Sept. 19 loomed large for the Brewers, and the team knew it was in for its biggest challenge yet. The squad prepared and practiced for the big game under Head Coach Michael Warari the same way that they would for any other opponent, according to senior Alyssa More. “We break down [our opponent’s] strengths, weaknesses and tendencies based on a scouting report,” said More, “and then execute those strategies in the practices leading up to the game.” The team, More added, limits time spent fretting about statistics or rankings, instead opting to focus on their own game. The players took to the Weinberg turf field for what was to be an intense, dramatic and hard-fought contest under the lights on a cool but pleasant Wednesday evening, in front of one of the biggest crowds of the year. Vassar showed right out of the gate that they were not fazed by the Red Hawks’ reputation; the action took place primarily on the Red Hawks’ side of the field early on, with Vassar’s strong attack applying constant pressure to the Montclair defense. VC fans sat uneasily, even as it became clear the Brewers would not be outplayed by their higher-seeded opponent. Eventually, in the 17th minute of play, Vassar’s pressure earned a deciding corner. It seemed inevitable, however, that the talented Red Hawks squad would find some way to return the pressure and find a goal. Despite the early lead, the Brewers knew the game was far from over. Recollected Feeley of that moment, “We knew as soon as we scored that we had to play one of the best defensive games we ever played, as they are a very tough team to score on.” The Brewers were able to carry their strong momentum through to the end of the first half, but when the second half began, there was a momentum shift, and a Vassar defensive battle began. The pattern of the first half flipped in the second, as Montclair forced more corners than Vassar after halftime by a 6-3 margin, compiling seven total shots. However, despite a number of strong opportunities, the Red Hawks were never able to cash in and find the goal. Credit is due to the Brewer defense, who were able to prevent any formidable challenges from facing junior goalkeeper Liz Rotolo, as not a single of the seven shots was on goal. Vassar, on the other hand, totaled 12 shots in the match, with seven of them on target. As the clock continued to wind down, Vassar clung to its 1-0 lead. A very late corner for Montclair brought the game to its highest point of tension, but the Brewers were able to stop the attack and run out the clock to win the game 1-0. As the final buzzer sounded, the Vassar squad—having defended home turf and handed Montclair an upset loss— erupted and sprinted to mob each other in front of the goal.